The iPhone 4 antenna issue seems to have taken a life of its own, and acquired a slew of nicknames in the process— “Grip of Death”, “Apple’s Vista”, “Antenna-Gate”, and “Hold Different” to name a few. Consumer Reports’ verdict accompanied by what’s perhaps the best video demonstration of the iPhone 4’s antenna design flaw makes it hard for anyone to argue it’s anything but a design flaw. Recent blog comments, obviously from loyal Apple fans and customers, are on the lines of “I’ve had the product for X days of weeks and don’t see an issue. It works for me.” Perhaps that’s what years of Apple magic have achieved – complete and total trust, loyalty, love, and adulation. I’ve talked to many iPhone users, some of them quite technical whose opinions I trust, who haven’t noticed the antenna issue, so that’s a fair point. If you don’t experience it in your real-world setting, it’s not relevant. But it’s wrong to assume that the issue doesn’t exist, or that nobody’s experiencing it because you aren’t. Here are some pictures from real-world setting that demonstrate the “Grip of Death”. Of course, this is in no way a scientific test in a RF-isolated chamber— you can watch that in the Consumer Reports video, along with scientific instruments used to measure the signal. My test simply illustrates what I’m seeing consistently in my home. 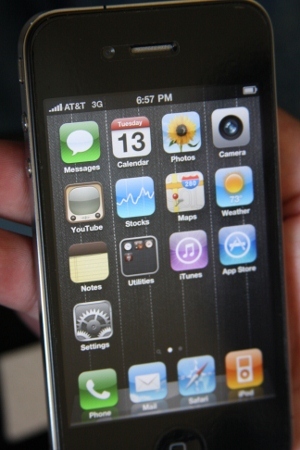 The first photo shows the iPhone 4 in its “Hold Different” position— the way Steve Jobs may want the whole world to hold it and not complain. 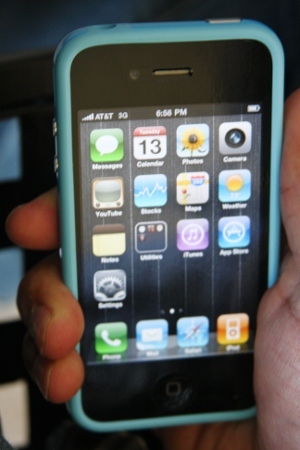 The phone shows a powerful signal, just as any AT&T “More Bars In More Places” ad. When holding the phone as many of us would normally hold it, the signal drops substantially. I couldn’t replicate the same issue at Apple’s Palo Alto store, but here at home, in my natural, real-life surrounding, I see it, and can replicate it consistently. 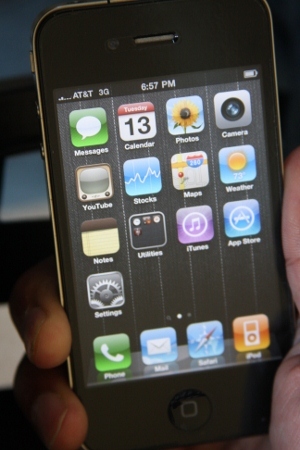 In this last photo, the iPhone 4 is now outfitted with a $29 Apple iPhone 4 Bumper (around $32 with taxes). As you can see, held in the same position, the phone has recovered from the signal shyness induced by the “Grip of Death”. There are many reasons to own an iPhone 4, and Apple CEO Steve Jobs spent considerable amount of time showcasing its brilliant engineering prowess during the phone’s launch. But Apple’s refusal to accept a design flaw and provide a fix that’s not vaporware— like its proposed software update, should make one think about buying anything from Apple. Apple is STUNNED! Or maybe it doesn’t care since the stock didn’t tank much? Steve Jobs’ ego apparently has a higher premium, much higher.